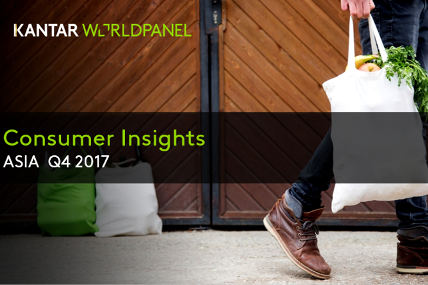 2017 Q4 Asia Consumer Insights report is now available with FMCG trends in a variety of categories in the region, covering China, Indonesia, Korea, Taiwan, Vietnam, Malaysia, Thailand, Philippines, India and Saudi Arabia. Food sector remains the key contributor to the total value sales in FMCG market, grew by 3.6% in 2017 from a year ago. Personal care is the best performing sector, with 7.8% year-on-year growth in 2017. The desire to look beautiful and young continues to drive the demand in this sector. Consumers’ living standard and awareness of health are factors to keep stable growth of 3.4% in home care sector. Growth in Dairy sector has slowed down to 2.6% in 2017 from 4.5% in 2016. Marketing initiatives done by top ice-cream companies leads to excellent growth in India. Beverage sector posted a higher year-on-year growth in 2017, 1.3% as compared to 0.1% in 2016. Packaged water, tea and coffee are the growing categories. In the Philippines, though slower compared to previous year, the economy grew faster at 6.7% than projected in 2017. Households are prioritizing family's health and giving value to their children's growth as seen in the rise of milk, dairy products, and baby food. *South region in Saudi Arabia is still excluded from this Q4 report as efforts are ongoing to resume data collection.